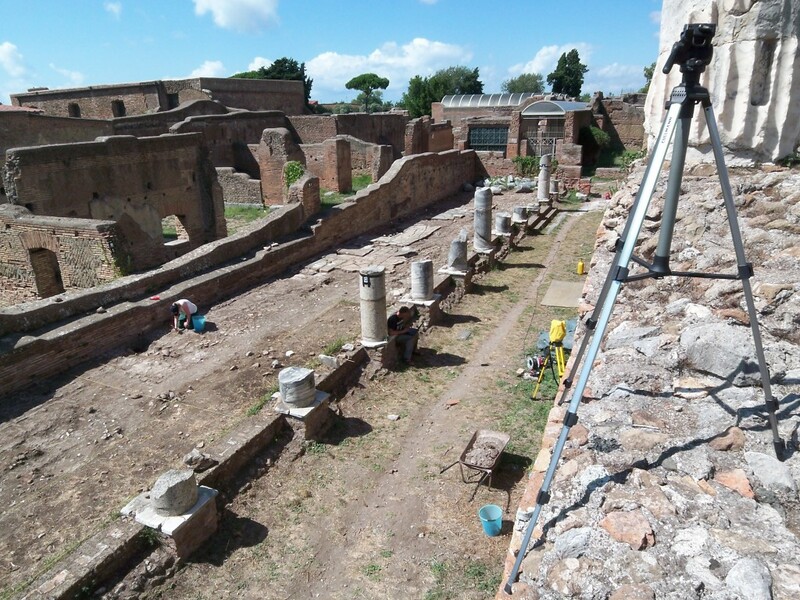 In the campaign of 2011, we cleaned the portico west of the Capitolium, MFW (see picture below). Beside a few areas of preserved slabs, the major part of the portico consists of mortarbedding. Archaeological surface-cleaning brought a rich evidence of late antique repairs of this mortarbedding and post-antique postholes of later reuse and robbing-activities to light. Surprisingly, parts of the mortarbedding show signs of former statuebases, which were lost during the centuries after the Forum was neglected. The traces in the mortarbedding allowed us to reconstruct the shapes, sizes and positions of these statuebases. According to the irregular layout of the majority of the statuebases, we assume a late antique origin. This hypothesis is supported by the mortar-stratigraphy itself. 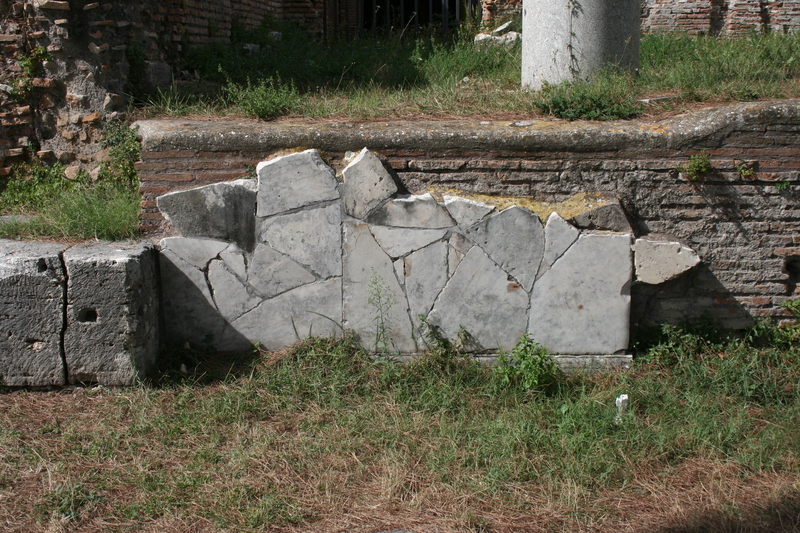 The blue phase resembles a late antique repair of the 5th century: all statuebases marked with A (see picture below) are part of this building-phase, as are the slabs visible on the picture. A major collapse-catastrophe destroyed the slabs, which show concentric cracks. After this catastrophe, several slabs were replaced next to the destroyed parts of the pavement. This is the hitherto latest monumental repair in our chronology. As a consequence of static problems or earthquakes, the mortarbedding had sunken very irregularly. The latest changes to the original structure of the portico analysed so far, are marked with the letter D (see picture below). In the latest monumental repair-phase, architectural decoration elements were used to fill the gaps in the pavement. A characteristic feature of this last pavement are intentionally visible architectural features of the reused elements: in all other porticoes we found decorated elements put upside down in their mortarbedding. In MFW there is one exception of this regularity, where the decorated element is put upside up (see B in the picture below). Areas of later refill suggest continuos building-activities in the 6th century or later (see area C in the picture below). Approximately 20 % of the portico’s slabs are preserved. However, the remaining part of the portico shows at least the imprints of the slabs, which have been lost during the centuries (see picture below). 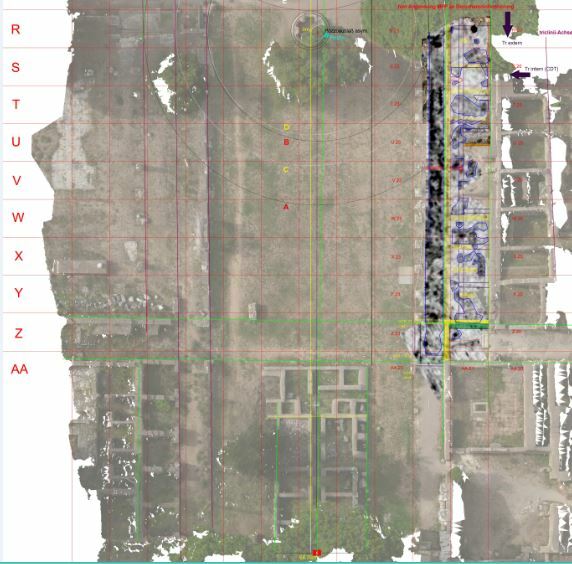 Due to the imprints, we are able to quantify the amount of decorated architectural elements reused in the last pavement-phases. Compared to the portico MFP, the amount of spolia with simple decorated architectural elements is higher, while the amount of complex decoration is much lower. One possible interpretation of this phenomenon is that not entire monuments were reused here as seen at MFR (see section “Spolia-Surveys: Unknown monuments reused in late pavements“), but obviously material from deposits in a random manner. In MFP, elements from the former entrance-arch were reused in two different parts of the pavement. Similar to MFR, one whole monument was used to fill the destroyed parts of the pavement. In MFP, it can be assumed that the original monument was nearby the position, where the elements were reused in the pavement. The same could have been possible for MFR, where the monument of the Egrilii dedicated to the imperial cult could have originally been standing in front of MFR or in the near. Similar to the portico MFW, the last building-phase of the pavements in MFR respect the positions of statue-display. 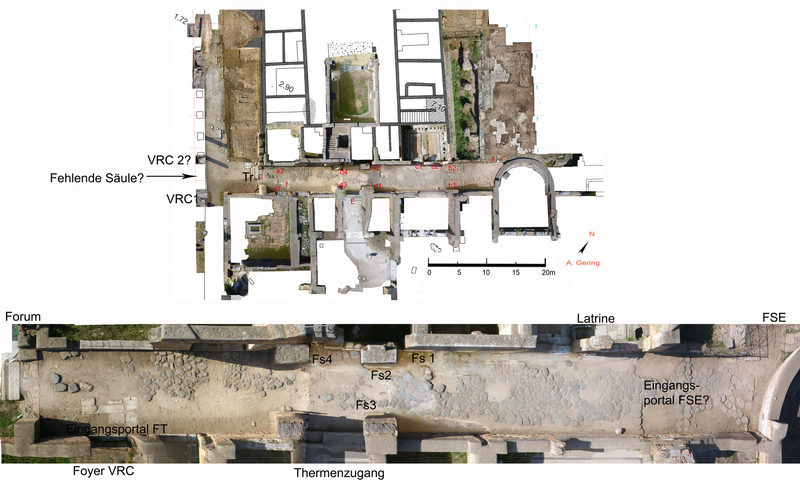 In the room south of the main hall of MFR we can find one large podium, originally approximately 40 cm high, in the middle of the entrance-axis (see “Podium” in the pictures below). In 2010, two podia of the same kind were excavated in the room north of the main hall. Older plans resemble these two podia, which had been excavated partly in 1912. Finds of coloured marbles including porphyr, which was reserved for the most important statuary, and decorated parts of opus sectile support the hypothesis that these podia were decorated in an expensive manner. Therefore, we can assume that these rooms were used for the display of especially important statues, maybe of the imperial court. In the excavations in 1802-1804, several fragments of statues of the imperial family were found in the northern half of the Forum, with the focus on the Antonines. In the eyes of the late antique spectator, especially these emperors were seen as good rulers, even in the christian interpretation of history. 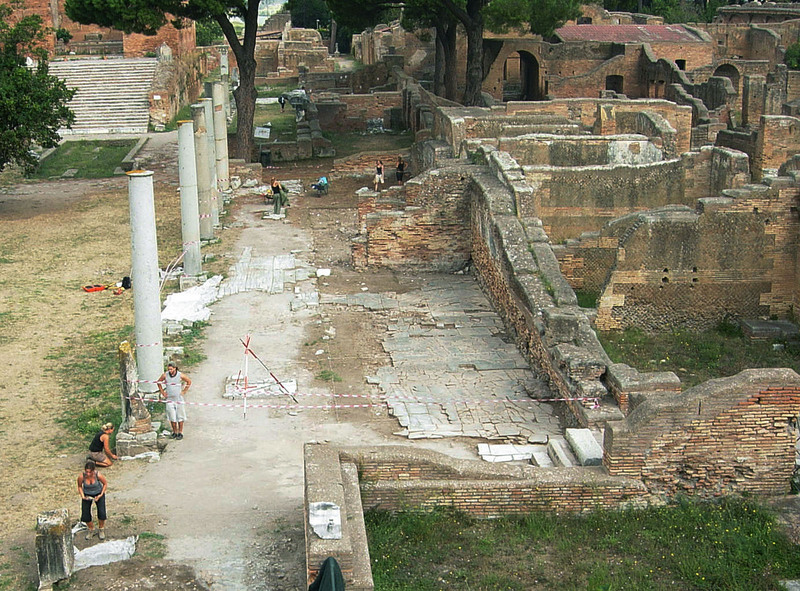 The excavations conducted in 1804, 1827, and 1880 around the Capitolium provide evidence of the kind of statues erected at MFR and MFW, due to the fact that the excavators did not penetrate the preserved pavement, thus indicating that the statues were laying above the pavement. The majority of the statue-fragments are heads, whereas several of them can be identified as being depictions of the imperial family from Trajan to Caracalla. 12 fragments can be identified with certainty: 2 fragments (1 head and 1 small statuette) depicted Antoninus Pius and 2 depicted his wife, Faustina. The remaining 8 fragments depicted 8 different individuals, thus suggesting a wide variety of different imperial statues. Further 8 fragments, mostly heads, depicted gods, for example Jupiter, Hercules, Bachhus (Silenus? ), and Cybele. 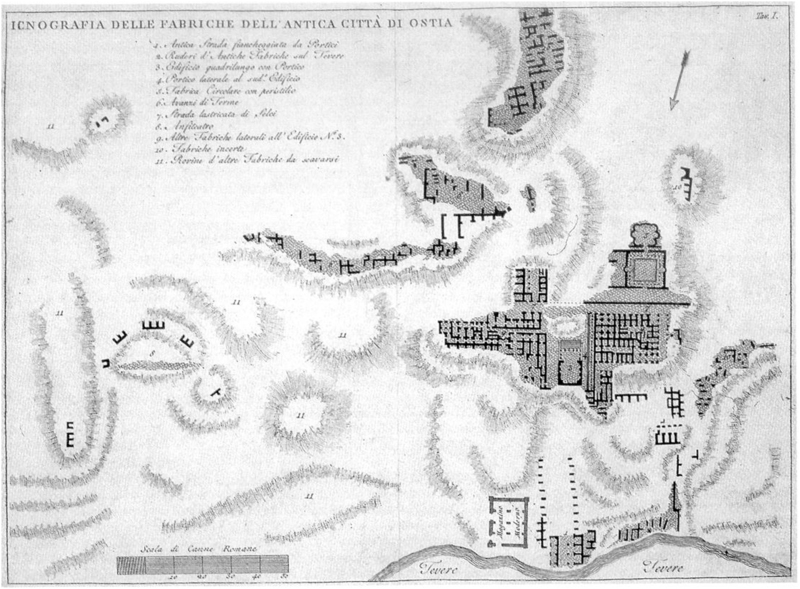 2 fragments depicting magistrates were also found during the excavations (see picture below: plan of Petrini’s excavations 1802-1804, drawn by Holl 1805). The heads of Marcus Aurelius, Didius Iulianus, and one magistrate were found behind the Capitolium and were found in 1803, whereas the others were found at MFR, MFW, and the Capitolium in 1804. The statues were most likely transformed into art objects, due to the variety, but could at the same time have possessed several meanings. 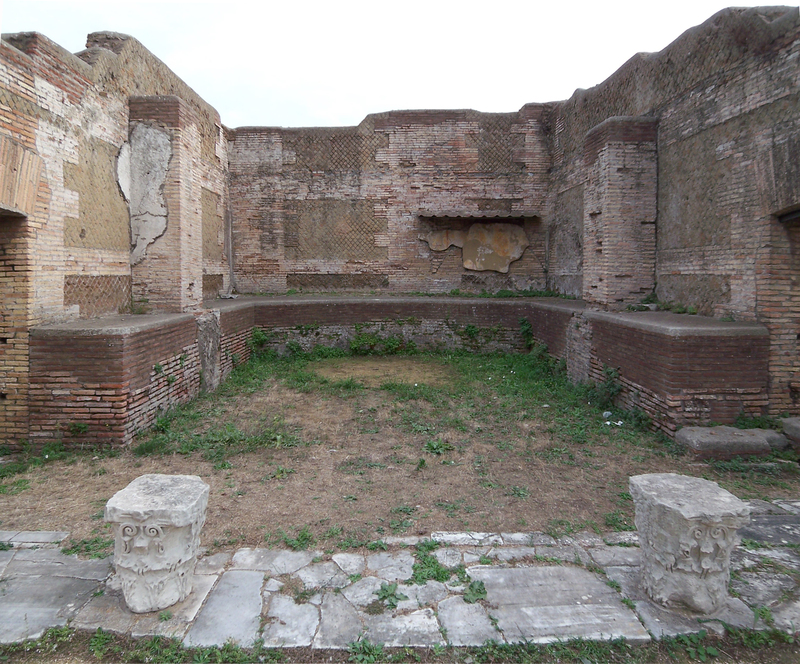 The variety also suggest that the officials responsible for the monumental centre of Ostia, and especially the northern half of the Forum, did not favour any pagan deity in Late Antiquity, thus further indicating that several emperors and pagan gods still had a significant meaning for the late antique citizens, even though it most likely was as art objects like seen at the Forum Romanum, especially at the Basilica Iulia. In previous times, the statues were a public art form containing a social function. The late antique function of the imperial statues may have been as a recognition of authority and relations to the imperial family by the Prefect of the Annona. 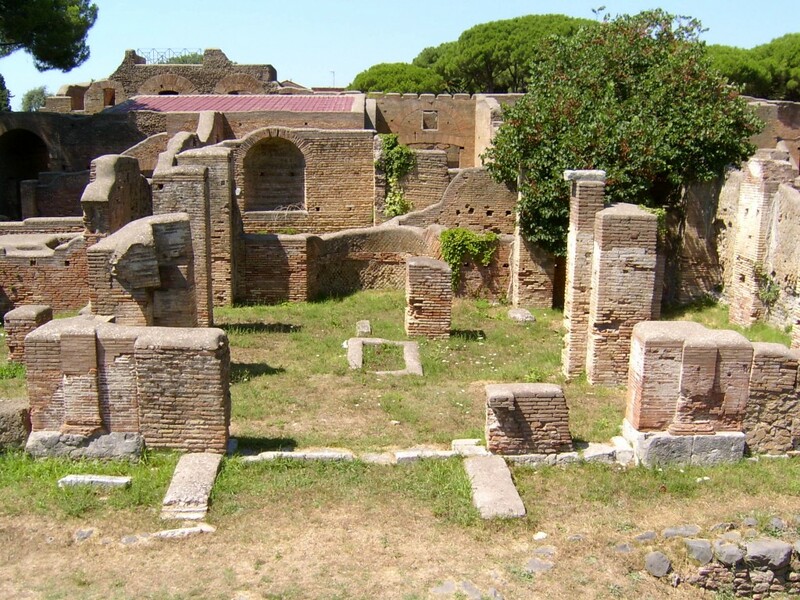 A curia was repaired in the years around 420 according to one of the few preserved building-inscriptions of the 5th century. If we identify this curia with the temple-like structure in the west-end of the Forum, which is called ‘Curia’ or Augusteum in the modern research, then it would be verified by the building-history itself, which shows clear signs of one major repair in Late Antiquity, due to the use of spolia, late mortar types and re-cycled building-materials. Unusually thick slabs were used to re-pave the entrance area and even the socle of the construction (see picture below). Roughly the same building-history can be attested to a huge building in the east of the Forum, which consists of the areas ADB and CDB (see picture below). When firstly excavated in 1916, a large coinhoard was found in the floor of the latrine. The filling between the 2nd century walking-level and the late antique level demonstrates that material from a major collapse-catastrophe was reused to raise the walking-level inside of buildings as well. According to a recent study by Lena Kaumanns, after the collapse of the former multiple-storey-buiding, a completely new roof had to be built. The building itself was now probably reduced to two floors with an external staircase. The coinhoard dates the collapse with a TPQ after the late 4th century. 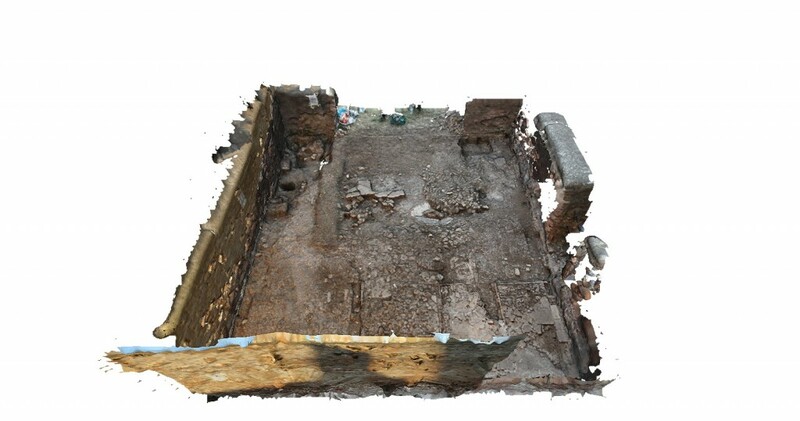 A detailed analysis of the ceramics found in the filling-layers inside the building in 2010-2012 will be analysed in detail and will allow us to date the time of the collapse more precisely. A nearby building south of the Decumanus (CDT) also shows the evidence of a collapse, where a complete re-decoration and a re-inforcement of the groundfloor walls were necesessary (see picture below). The dating of the wall-painting ranges from the 3rd until the 5th century. 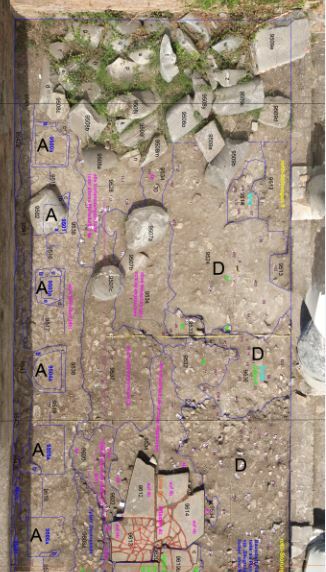 The pavement allows a more reliable dating by common characteristics of the slab-paterns and mortartypes with a roughly contemporary late antique building-phase in MFP of the late 4th and 5th centuries. The reinforcements were built due to static problems, probably as a consequence of earthquakes or exceptional flooding-catastrophies. Similar reinforcements are found at the Forum-bath’s (TDF) facade and in the nearby street, VDF. These building-activities were already seen as consequence of earthquakes by earlier research. 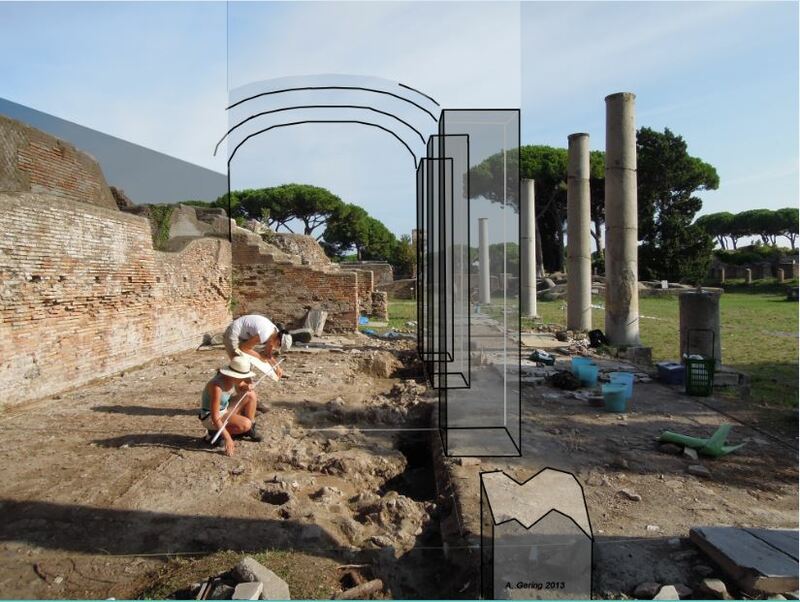 The excavations in 2010 in VDF brought new dating-material to light, which allows us to postpone the date of the collapse from the early 4th to the later 4th or 5th centuries. In 2013, we cleaned another monument in the middle of the Forum (MUN). Again, we found clear signs of a late antique collapse and a fundamental repair of the building’s features. 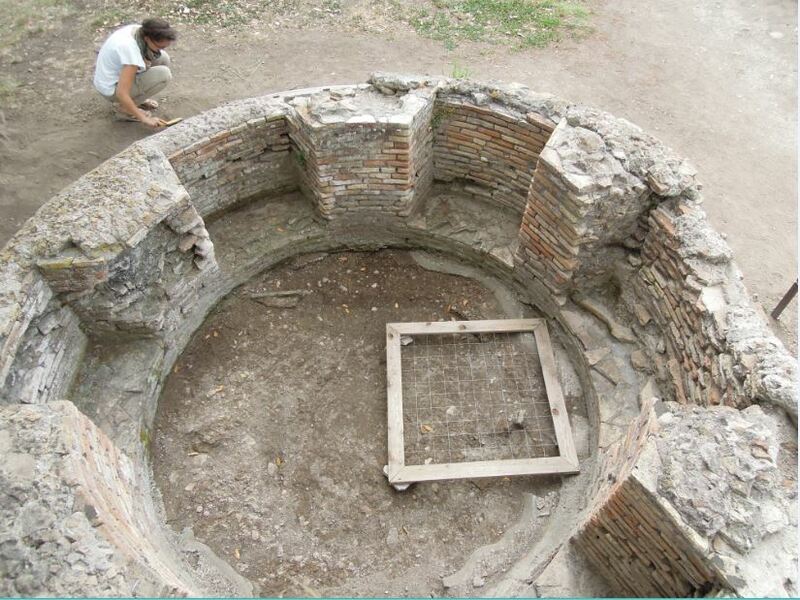 At the same time, the function of the building changed to a nymphaeum with a closed front (see picture below) and a modified cascade in the area, where the natural spring-water entered the internal water-bassin. 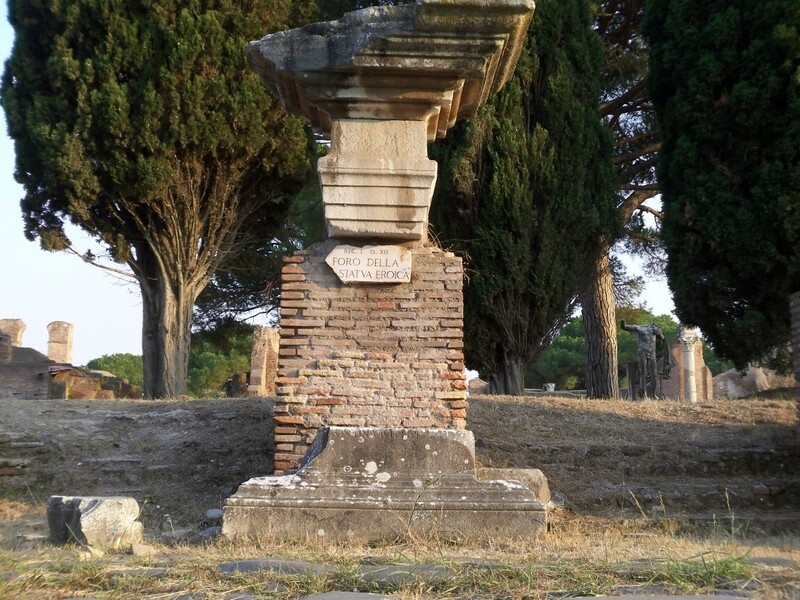 This very important centre of Rome’s first colony obviously still served as a landmark, which was able to commemorate the whole history of Ostia. 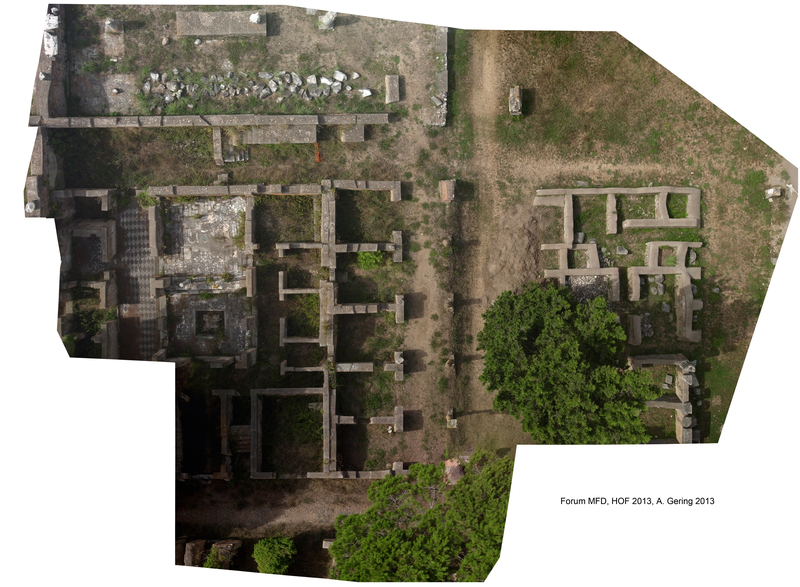 A similar collapse and building-history can be attested to a major plaza (FSE) east of the Forum, which had been built in Late Antiquity on top of a collapsed bath building. At FSE, the facade consisting of marble architraves, showed clear signs of a second reuse (see picture below). The architrave was originally designed for a two-storyed entrance-architecture, which obviously underwent a severe damage, due to an earthquake. As part of the major repair-phase of the collapse, we also found improvised postholes in front of the marble architraves. An inscription in three fragments was found in the near of the facade in 1913. According to our reconstruction of the collapse of the facade, we can assume that this inscription belongs to the monumental entrance to the plaza (FSE). The inscription mentions the overall repair of a market (macellum reparatum) in the years 418-420. It is possible that this inscription mentions specific repairs after one of several collapse-catastrophes of the 5th century. A collapse-catastrophe, which would have been severe enough to cause a rebuilding that was sufficiently subtantial to be mentioned alongside a prominent name of the Prefect of the city of Rome, Aurelius Symmachus. It would not be a big surprise to find similar signs of damage and collapse in adjoining buildings. 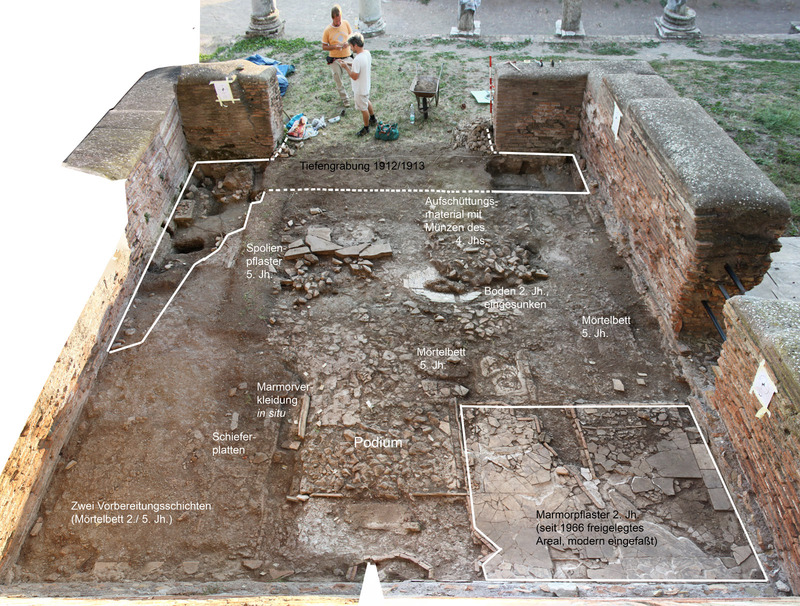 During the campaign in 2010 and 2012, the north part of the portico MFP was excavated to its original late antique surface (see picture below). 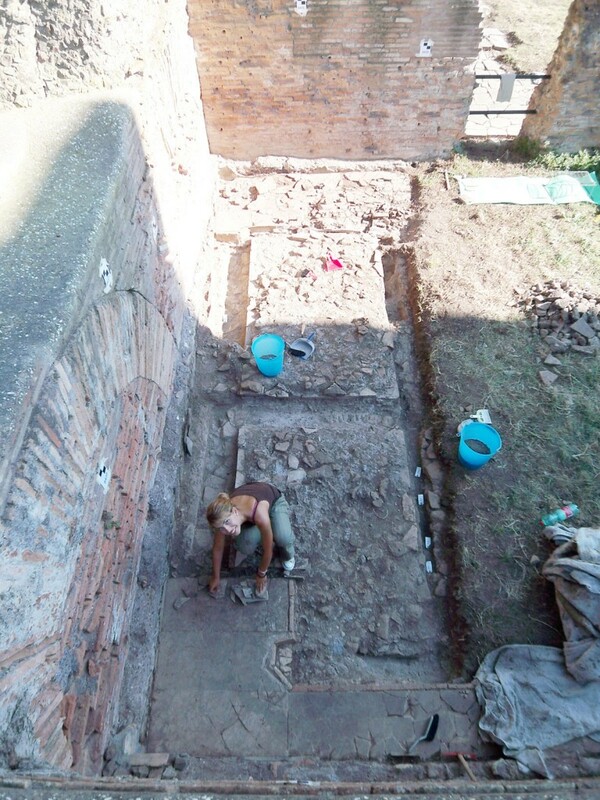 We found a well-preserved stratigraphy by cleaning former irregular and undocumented excavation-pits. Therefore, we were able to draw profiles of the stratigraphical development of this portico from the 1st to the 5th centuries. In the first building-phases, MFP consisted of a two-storyed portico with a concrete vault supported by rectangular pillars (see picture below). The granite columns visible today were a later addition. The vaulted ceiling had obviously collapsed, due to a major seismic event at a certain time in Late Antiquity, when the portico still was important enough to be restored. As a consequence of the almost total damage of the concrete vaulting and the pillar-structure, all pillars were removed, and the portico-area was extended to the present visible granite columns. New pavement-slabs covered the area of the former pillars and a new roof had to be built. The extension of the portico in the groundfloor was probably a consequence of the loss of the former first floor. After the collapse we can reconstruct the portico with 12 columns and a simple wooden architrave based directly on top of the columns in the height of approximately 5 metres . 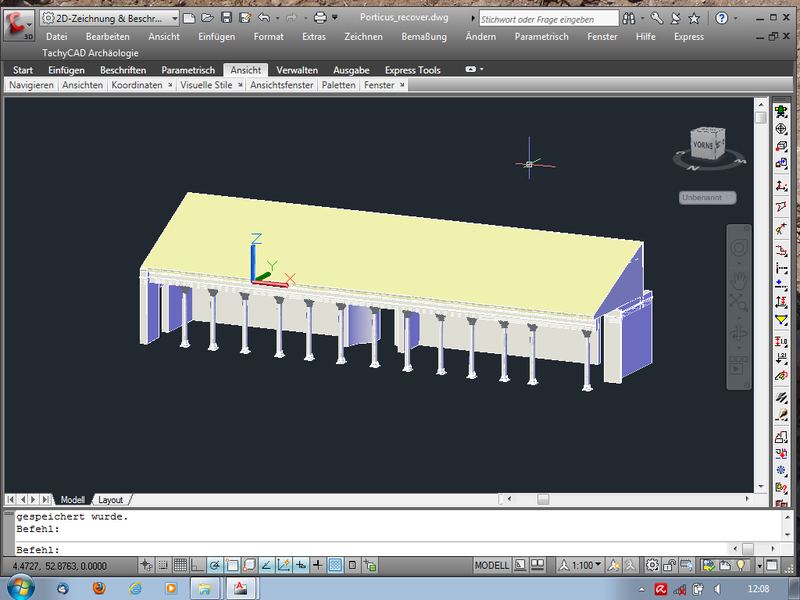 The reconstruction-model is still a work in progress regarding the 13th column in the southwest corner of the portico and some other details like the angle of the roof (see picture below). 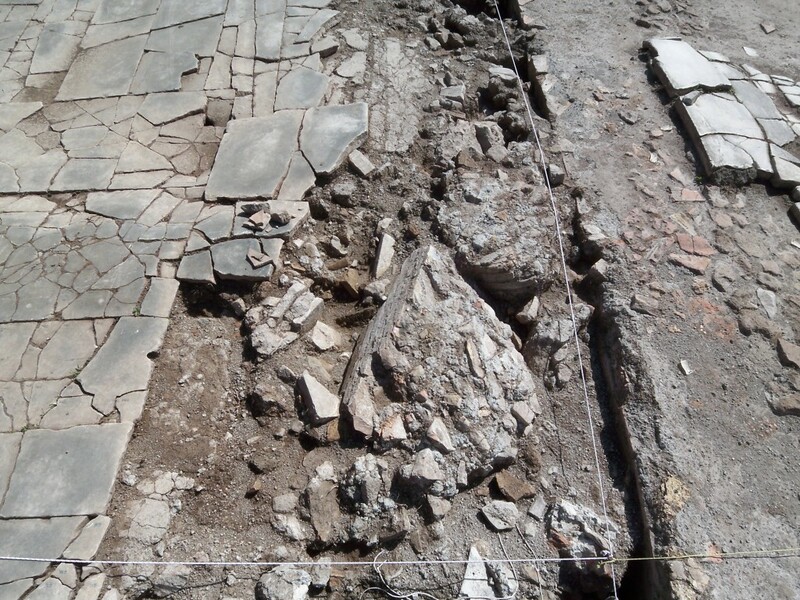 Important finds consisted of big fragments of walls from the 1st and 2nd centuries that were part of the re-fill underneath the latest pavement (see picture below). These walls demonstrate that the predecessor of the present visible portico had been completely dismantled, like suggested with the Roma and Augustus temple (TRA). It is highly likely that many similar phenomena like collapses, dismantling and rebuilding could have been caused by the same catastrophe as extraordinary floodings, fire-catastrophes or seismic events. 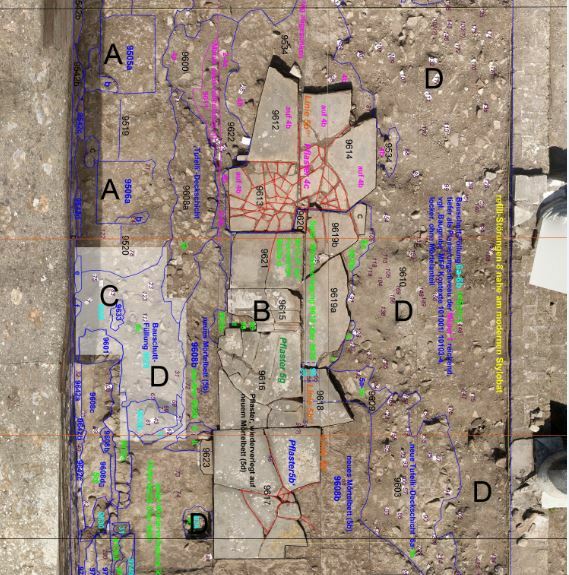 The only stratum of burned material found so far, could be dated to the late Trajanic or early Hadrianic building-phases. For the late antique collapse, we can exclude, based on the hitherto analysed material, a fire-catastrophe. Many specific shapes of cracks in the fundaments, walls and in the mortarbedding underneath the slabs (see picture below), seem to support the hypothesis of an extremely severe earthquake in the late 4th or during the 5th centuries. Like nowadays, earthquakes of this strength rarely happen in the area around Ostia, which is located and based on a relatively ‘safe’ underground according to our geologists. 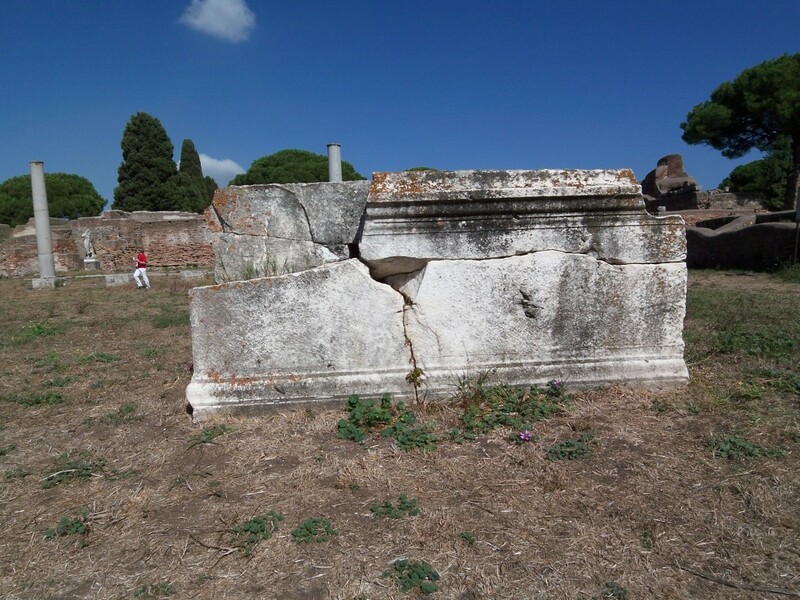 Another interestig example of the intentional dismantling of a monument is the socle of the equestrian statue of Manilius Rusticianus (MLR, see picture below). With the help of a photography from 1923 (Archivio fotografico Soprintendenza di Ostia, B2283/4, Inv. 4772-4773), it is possible to say that this socle was found originally at the west side of the temple of Roma and Augustus (TRA). Today, the statue base is located in front of the Roma and Augustus temple to the west. Due to the fact that it originally was found along the western side of the temple, it most likely functioned as a filling in the level-raise. This level-raise would have covered the ruins of the podium of the Roma and Augustus temple between the two porticoes MFD and MFS, which both had a raised level approximately +1,2 m above the present Forum’s plaza-level – the lower Forum’s level is caused by the excessive excavations by Guido Calza. It seems unlikely that a prominent equestrian statue would have been placed immediately against the temple-fundament, thus preventing spectators from walking around it. Another interesting feature is visible on the east side of the monument, where traces of deep chisel-holes demonstrate an intentional destruction, with a purpose of dividing the monument into several pieces for reuse as building-material, but not for simple lime-production. 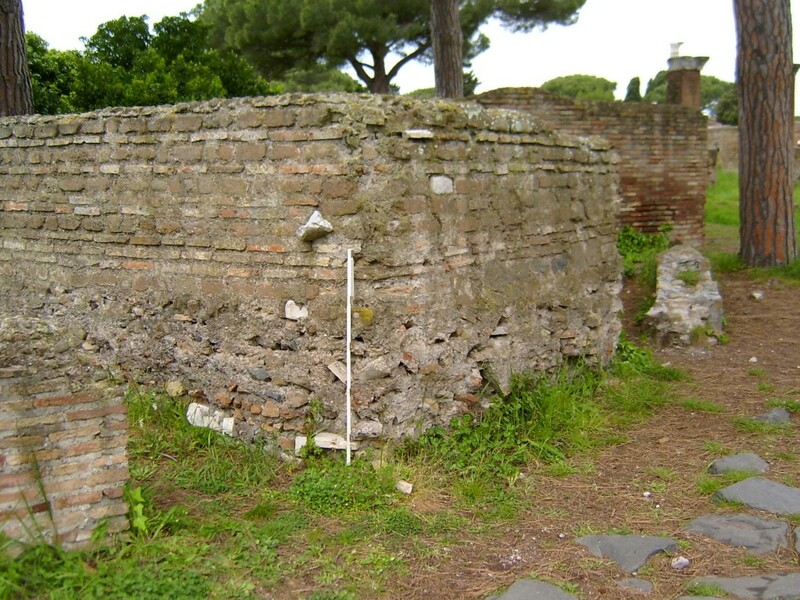 Another example of a late antique level-raise roughly 1 m above the present walking-levels can be found in a latrine, which was flushed with water from the Ninfeo delle Venere (NDV). The height of the fundament is still visible (see picture below), and dates the level-raise before or at least in the time of the construction of the latrine in the early 5th century. 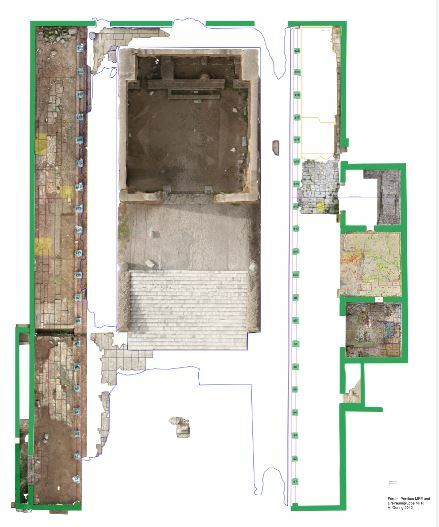 Considering the late level-raise in the area around and south of the Roma and Augustus temple, we can reconstruct the latest phase of this area: after the dismantling of the Roma and Augustus temple, the rooms of MFD were closed and the whole building underwent a fundamental functional change. Instead of its former official, monumental and representative outlook as a Forum’s portico (see picture below), where the backrooms of the portico possibly were reserved for related official financial business, like for example money exchangers or banks, it was now turned into an area for artisans re-working spolia for new pavement-slabs.